It might be hard to believe, but Jeff Waters and Annihilator have been melting faces and rocking stages with their ferocious brand of Canadian heavy metal ever since 1984. More than three decades and millions of record sales on, they’re still a musical force to be reckoned with, and a huge influence to countless metal bands across the globe. So, when Jeff and Co. decided to visit Hughes & Kettner HQ, we jumped at the chance to ask them all about their favorite gigging amps! The typically tranquil town of St. Wendel, Germany, got a whole lot louder for one week in summer 2014. Sure, there’s not a day that goes by at Hughes & Kettner HQ when someone doesn’t turn up and thrash away on their amp of choice – it’s all highly important tone-based research, honest – but this was different. Very different. 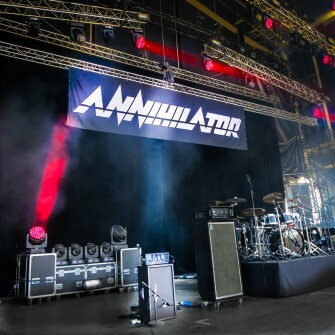 Because for a few select days, Jeff Waters and the Annihilator crew commandeered our demo hall and used it as a base and a practice space while they jetted (well, bussed) around playing a selection of Europe’s biggest metal festivals. 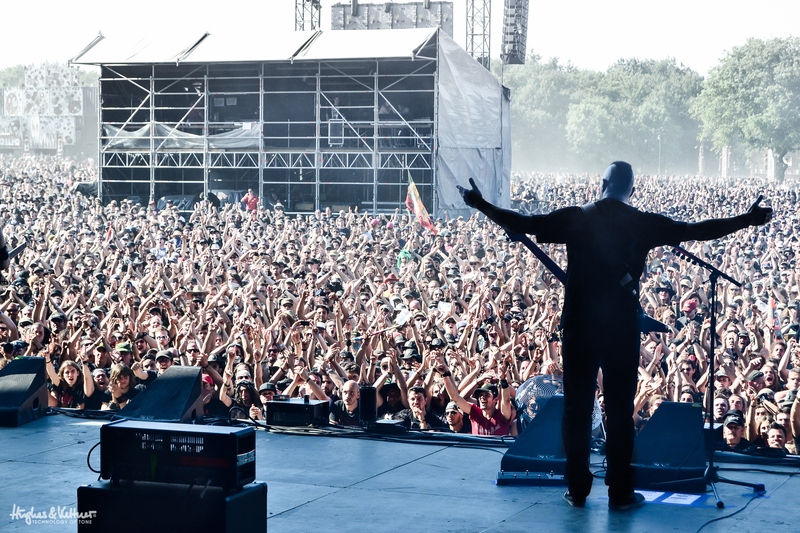 Jeff Waters rocks the 2014 Hellfest with Annihilator. Note the adulation from the 30,000 fans, and the GrandMeister just poking up in the bottom left of the shot! This was a big thing for us. And not just because Annihilator are awesome, and great people to boot. It also gave us the opportunity to talk with Jeff and vocalist/guitarist Dave Padden about their love for the GrandMeister, and their readiness to use it in front of 30,000 people at places like the Hellfest. You see, metal guitarists have a history of using full stacks – they look cool, they’re loud as hell and we often have the impression they’re the only thing that’s going to give us the amazingly fat low-end that down-tuned riffery demands. So persuading serious musicians that a somewhat smaller 7.7kg head can do the business can be demanding. We’ll let Jeff and Dave do that for you. In the video, Jeff takes us through his initial impressions of the GrandMeister when he first heard about it, his reaction after playing it, and the response it brings from other bands who come into contact with it. So, there you have it. Proof – if it was still needed – that a small amp can indeed sound just as huge as something way bigger, whatever your stage. And what other globetrotting metal band can carry four of their main amps in two small suitcases? First published: December 12 2014. Most recent update: October 02 2015. I play clean but usually snappy, loud, hendrix like stuff. And i guess if I play enough small venues i can afford a bigger amp. Thank you! Ok, I have a Tubemeister 18 and a 1×12 speaker cab with a Celestion Creamback 75. Im planning on doing my very first gig and ive played guitar for a year. Is it loud enough for the stage? If so, Whats the biggest venue it can take? Hey Guido – I’m glad you like my tone. I’m using a Marshall 2×12 cabinet with G12-65 heritage speakers. The Grandmeister sounds really warm and smooth with that cabinet. Ampwise, I mainly use the Crunch channel for rhythm with very few bass while mids and treble are almost in the middle position. Gain is at 2 o’clock. From time to time I add the boost to have a little more sustain. For lead tones I use the Lead channel with a little delay from the onboard fx unit dialed in. With the band I’m always playing at 36 watts. Thanks for the info Christian! That’s a really nice guitar tone you have and also cuts well through the mix. Would love to have some insights on your amp settings (gain, volume, eq, etc). Thanks for sharing. Wow, not even micced up? Cool! Ordered one for a customer and finally got to hear one. AWESOME amp! Planning on getting one for myself. I own a Grandmeister 36 for sbout to months and it rock like hell. Small size but hughes sounds. I can recommend this amp. Annihilator is a great band!!! I agree ! I use Grand Meister36 since one year or so, and it replaced my Diezels, Marshalls and Bogners amps ! Man, IT SOUNDS HUGE !! !